Roll & Pop Train Toy is rated 4.5 out of 5 by 12. 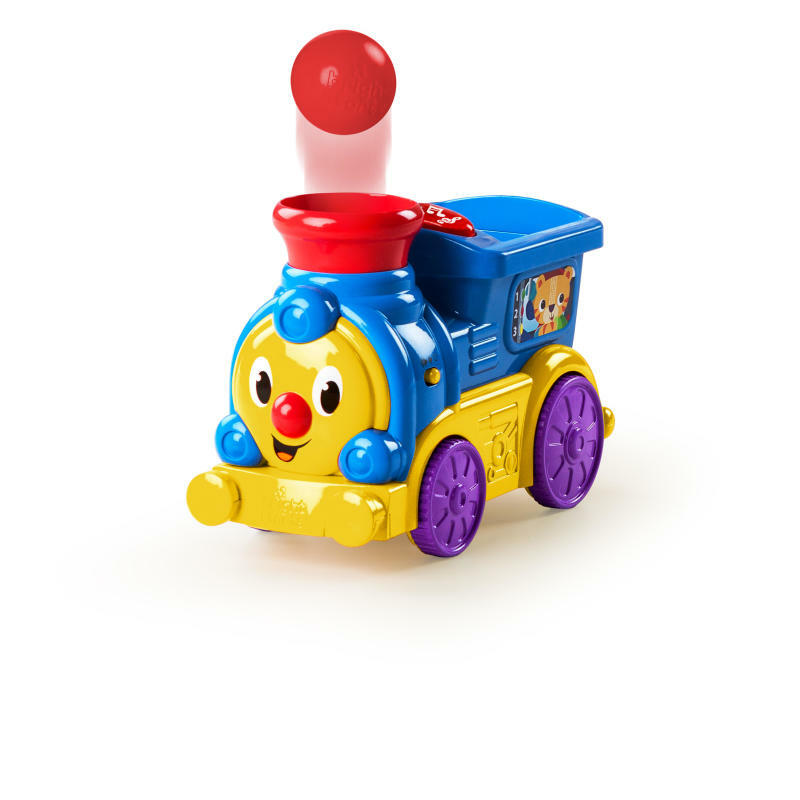 Baby will be making tracks with ball-popping action from the Roll & Pop Train™ from Bright Starts™. Baby places a ball in the train's coal car and as the locomotive moves forward, balls begin to pop out of the spout! Baby will love chasing down the balls to keep the fun going. A light up button controls lights, melodies and train sounds. 3 balls are included, but more can be purchased from the Bright Starts Having a Ball™ collection. Dimension (in) 10.3" x 4.9" x 6.8"
Rated 5 out of 5 by Spm3648 from Such a fun train! My toddler loves this train. It is cute and simple. It's amazing that when it pops the balls up, they fall back in the train with such accuracy. I've already bought this train for my nephew! Rated 5 out of 5 by Appyjumper from My son is OBSESSED! My 2.5 year old son is obsessed with this toy! It's by far his favorite! I love that it moves on its own and he can chase it. He knows exactly which button to push to make it sing and the songs aren't annoying at all. Best thing is you can turn it off! Haha! Rated 5 out of 5 by LaurelElaine from So Much Fun! We opened this toy and turned it on for my toddler and he was in a state of instant joy! He love to follow, push, and fly this train around everywhere! Chasing the balls that pop from the train is exciting and keeps him busy! The only downside is that my child likes to try putting other random household objects into the train (which is expected with any toy). My son loves this toy and his mama loves the easy entertainment it offers. Rated 4 out of 5 by Csparks4 from Great toy! This is a great toy! It engages our son with the music and he loves to see the balls pop. I would recommend buying this! Rated 5 out of 5 by AudiAnne from Our 7month old loved this train, the sounds and the lights are very entertaining for him and educational as well. In addition, the ball pops up and down, makes for many laughs.